It gives me real pleasure to be able to write this follow-up article to my blog post dated 04/05/12. 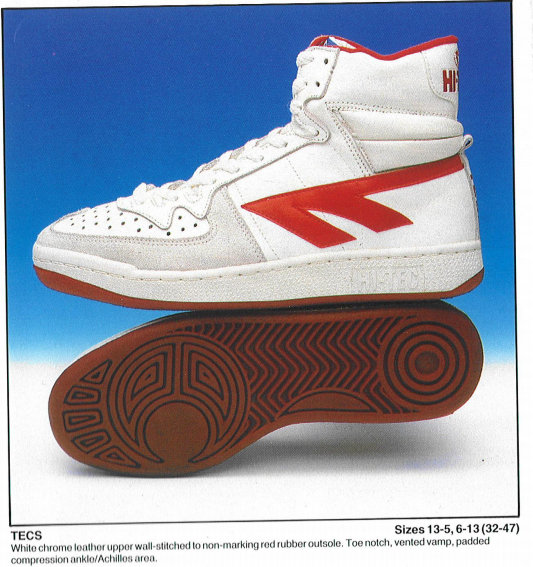 Having been somewhat surprised, and indeed disappointed, not to be able to track down an image of the 1980s red striped Hi-Tec Tecs basketball boot, I got in touch with the company - I shared my post and asked if Hi-Tec could help and provide an image. To be honest I had expected my request to get ignored! BUT I couldn’t have been more wrong and it delights me to be able to write this follow-up piece. Shortly after my enquiry, I received a nice note from Jayne Scrivener in customer services. She advised that an electronic image was not available but rather than leave it at that (which I would have accepted), she went on to state that there was a vintage catalogue in her Chairman’s office and that she’d do her best to get a scanned image sent to me once the chairman was back in the country. And Jayne, much to her, and indeed Hi-Tec’s credit, followed through on her promise. The image is here for you all to enjoy. Hi-Tec has shot up in my estimation by being willing to help. My enquiry wasn’t related to a sale or to a complaint but it was allocated some time and professionally handled nonetheless. We are surrounded by evidence of poor corporate behaviour all the time (think LA Fitness for example) and so I think that decent corporate behaviour should be celebrated just as poor behaviour should be admonished. Feeling inspired, I went and rummaged through some old photographs and discovered another image to share (see below). Here is a photo of me wearing my beloved Tecs. I’ll admit that it‘s not a good picture of me at all; I was once the young, awkward/geeky looking teenager you see before you. The shoes though look great and that’s the point. Next time I am out buying running, or other sporting shoes, I’ll be looking for Hi-Tecs. In brand engagement/loyalty terms, it’s the little things that make all the difference.